Ein erster Schwerpunkt des Bandes thematisiert den Aufstieg des Hauses Lothringen und die besondere Beziehung, die die Herzöge von Lothringen mit Innsbruck verband. Der siegreiche Feldherr Karl V. von Lothringen hatte an der Seite der Erzherzogin Elonore als Statthalter in Tirol gelebt. Sein Sohn und Erbe Leopold ist in Innsbruck geboren worden und auch das letzte Treffen Franz Stephans mit seiner Mutter Elisabeth-Charlotte d'Orléans fand dort statt. In the summer of 1765, Innsbruck was in the focus of all European interests. From 5th August onwards, numerous festivities took place to honor the wedding of archduke Leopold and the Spanish Infanta Maria Luisa. Yet, the (sudden) death of the emperor Franz I. Stephan, Duke of Lorraine and Grand Duke of Tuscany, cast a cloud over the celebrations on 18th August. The present volume of the Austrian Society for Eighteenth Century Studies honors the 250th anniversary of these events as well as those prior to the incidents and the ones effecting the following years. A first emphasis is laid on the rising of the House of Lorraine (Aufstieg des Hauses Lothringen) and the special relationship between the dukes of Lorraine and Innsbruck. The victorious general Karl V. of Lorraine was a governor in Tyrol and lived together with the archduchess Eleonore. His son and heir Leopold was born in Innsbruck where the last encounter of Franz Stephan and his mother Elisabeth-Charlotte d'Orléans took place, too. 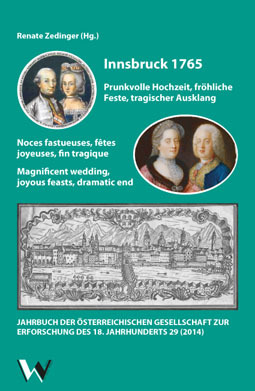 The chapter Treffpunkt Innsbruck: Sommer 1765 (The Gathering Place Innsbruck: the Summer of 1765) deals with the preparations and logistic challenges of a European wedding. This second focus contains an analysis of the (lengthy) correspondences of the empress with the governor count Enzensberg. In doing so, a remarkable impression of traveling in the 18th century is introduced. Examples of this are the troublesome journey of the Spanish bride or the Viennese court through Styria and Carinthia. Third, the fateful events of the wedding festivities ending with a death (Hochzeitsfeiern mit tödlichem Ende) are presented. The celebrations, the death of Franz Stephan as well as the bridal couple archduke Leopold and infanta Maria Luisa (Erzherzog Leopold und Infantin Maria Luisa), whose numerous heirs guaranteed the succession in the countries in the Habsburg empire, are in the focus of this part. Finally, the chapter Spuren ins Heute (Traces to the Present) discovers the effects of the events until today. After her husband's death, Maria Theresia ordered to change the medieval castle into a memorial in order to glorify the new Habsburg-Lorraine dynasty. The essays are about the development and restructuring of the Hofburg, the grounds of the court garden or about the art galleries in Innsbruck. The international and interdisciplinary orientation of the yearbooks is represented by the contributions in German, French and Italian form various areas of historical, cultural and literature research. There are also English abstracts of all contributions. Additionally, the volume contains reviews and research reports as well as corporate reports and personal matters of the Austrian Society for Eighteenth Century Studies. Forschungsbericht. Aktuelle Forschungen zur "Aufklärung"